There are a few people in life one wishes one knew. For me, one of those is the author of this book, Sam Posey (b. 1944). 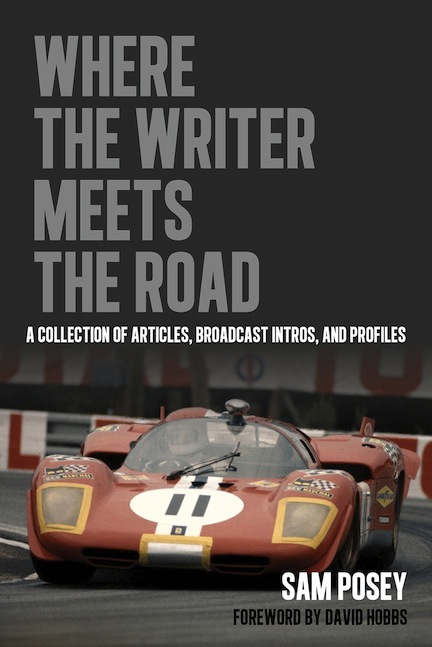 Although he is probably best known now for his work as a broadcast journalist, having done live race commentary and analysis for decades, as well as his atmospheric pre-race pieces for Formula 1 (“Posey’s Perspective”), Posey is much more than that. He’s an architect, an artist, a writer, a designer, an expert on model trains, and at one time was a damn fine race driver. Posey had two F1 starts, drove in Trans-Am, Champ Car, NASCAR, IMSA, Can-Am, Formula 5000 and at Le Mans, all with credible, competitive teams, matched up with aces like Hans Stuck, Brian Redman, and Michael Parkes. In some quarters, Posey’s privileged upbringing (leafy Sharon, Connecticut; private schools), higher-level education (Rhode Island School of Design), and perceived aloofness were seen as perhaps overshadowing his driving talent and acceptance among those drivers who got to the top “the hard way.” Success and time have a way of dissolving those perceptions and by all indications Posey is one of the most admired and respected personalities in motorsports today. Where the Writer Meets the Road is not a follow-on autobiography to Mudge Pond, although in a way it serves that purpose. It’s a rather slim volume of some of Sam’s articles, columns, television pieces, speeches, etc. 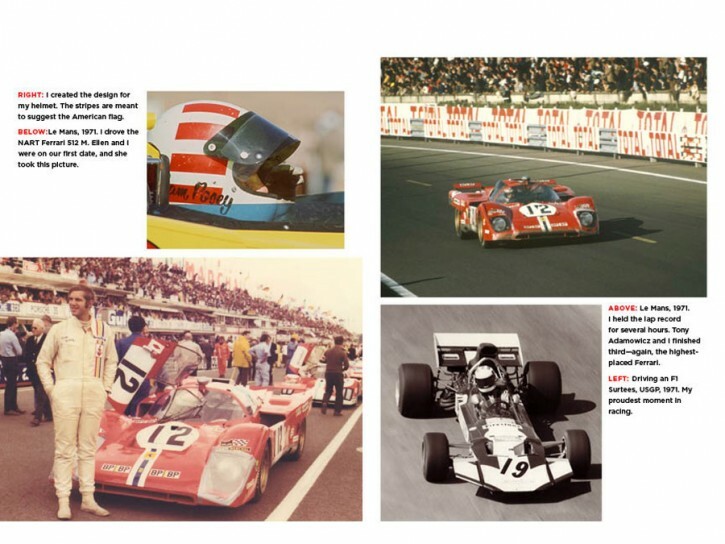 that he has created since retiring from racing in 1982. 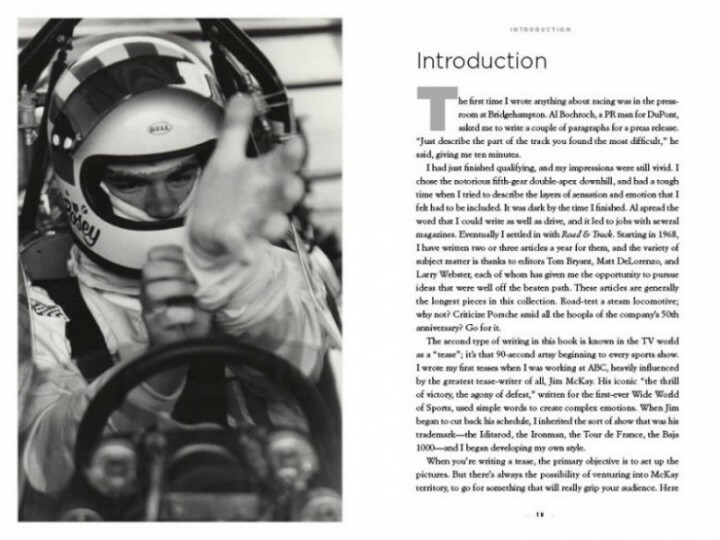 These include pieces as diverse as introductions of drivers honored at various award ceremonies, reporting assignments carried out for Road & Track magazine, first-person race reports, and even a few non-racing pieces slipped in as lagniappe, such as a tour of Ford’s River Rouge plant and a charming story about his eccentric Uncle Teddy’s Wind Wagon (“The torsional rigidity of this assembly is roughly that of a Persian rug.“). 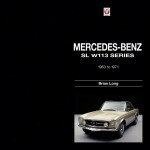 He also covered the Tour de France, cycling being another great interest of his, and also luge at several Winter Olympics but that is outside the scope of this particular book. This reader only wishes that there were more here to enjoy. 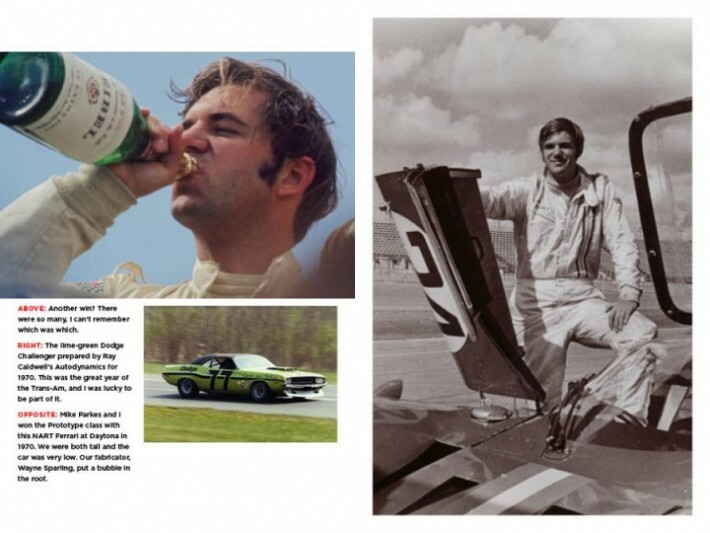 I was disappointed that, for instance, the classic photo of Sam brawling with Peter Revson in the 1970 Riverside Trans-Am pits was not included. Beyond such subjective stirrings, there’s little to criticize. Yes, there’s nothing here that hasn’t already appeared elsewhere, either in print or electronically, but it’s nice to have it consolidated in one place, and surely every reader will find much that he hasn’t read, seen, or heard before—or had long forgotten. 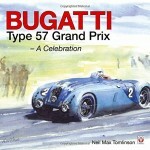 The strand that runs throughout the book, whether expressed in written or spoken word, is Posey’s genuine love for the sport, his respect for its traditions and history, and his admiration and affection for those he worked with in all of his professions; men like Phil Hill, Dan Gurney, Mark Donohue, Brian Redman, Jim Hall, Jim McKay, or Don Ohlmeyer. Sam’s revealing and touching Epilogue alone is worth the price of admission. Some people who have accomplished something in life get a street named after them—in 2013 Lime Rock Park (home, incidentally, to three of the 45 buildings Posey has designed) announced that the track’s front straightaway would henceforth be known as Sam Posey Straight. Won the 2015 Motor Press Guild’s “Best Book of the Year” award. Copyright 2015, Jack Brewer (speedreaders.info).